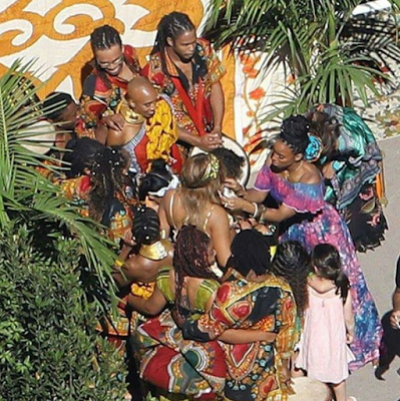 Grammy award singer Beyonce,35, who is expecting twins with husband Jay-Z, had an African themed baby shower to celebrate her upcoming bundles of joy with friends and family. The “Carter push party” which held on Saturday In Los Angeles, had African drummers, people dressed in African outfits and Afrobeats music blasting in one of the make shift huts. Celebrities in attendance included Jay Z, Mum, Tina Knowles, Kelly Rowland, Solange, Michelle Williams and a host of others.